In her introductory remarks, the head of MSSU, Dr. Lily Yarney, welcomed faculty members, students, staff and the guest speaker from Reach for Change Ghana, a non-government organization. Speaking on the topic, Professor Justice Bawole stated that the planning process of choosing the right career is characterised by five factors. 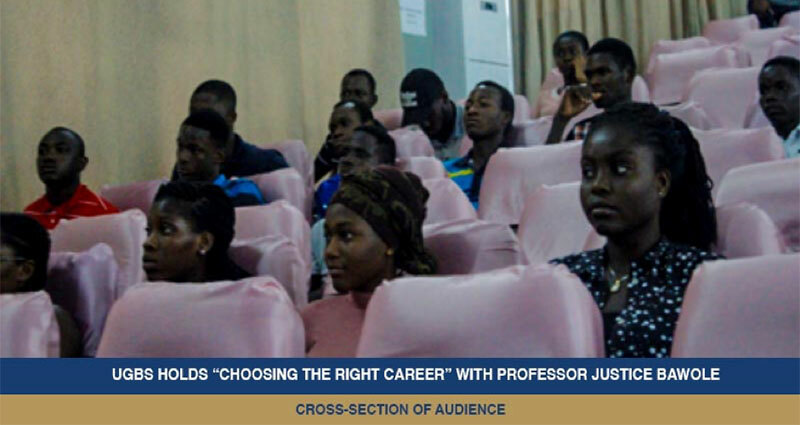 These factors include; knowing your values, learning about yourself, identifying your skills, researching career options, and linking your programme major and your career. According him, many students choose careers without proper career planning which affects them. He further outlined key factors to consider when choosing a career and these include; what a person loves doing, what pays well, and what a person is good at. He advised students to blend these factors in order to get the best out of their careers. In his closing remarks, Professor Justice Bawole cautioned students to refrain from designing curriculum vitae without job description since it hinders success. Country Manager of Reach for Change Ghana, Mr. Solomon Twum, also briefed audience about his organization and the opportunities provided for the student populace, the flagship of which is the student entrepreneurship support programme themed “The Student Incubation Programme”. The climax of the event witnessed a Q&A session where students were given the opportunity to seek clarification on issues, they were not clear about. The assistant coordinator of the Mentoring and Student Service Unit (MSSU) Mrs. Rachael-Garshong acknowledged audience for gracing the occasion.